Ken & Barkley - Ed & Joan - "The Food Show"
That's what the sign outside of the Hamburger Habit said. I had to try the best hamburger in So Cal for myself. Happy Meal and I ordered the usual plain cheeseburgers and sat down to await the glorious goodness of the superlative burgers promised by the signage. 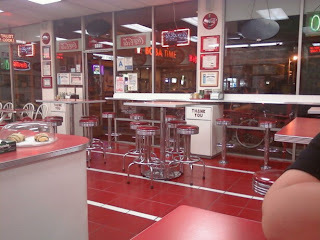 The interior was spotless uber-diner--red and white vinyl, tile, formica, and chrome. We listened to our burgers sizzling on the griddle as we waited and sipped our diet cokes. The place was festooned with awards, clever slogans, and Coca Cola paraphernalia. The Beef: 90:10 custom, fine-ground Chuck. The menu claimed that the Chuck was ground specifically for Hamburger Habit. It tasted like quality, lean beef. There was no trace of aged flavors, though. The Sear: Impressive and dark. Due to the thinness of the patties, however, the sear was uneven. The Seasoning: What seasoning? There was a hint of some latent salt from the griddle, but the patty itself was bland. They also did this weird thing with the salt shakers on the tables--they blended in some pepper, and then they put whole coffee beans in the shakers--presumably to absorb moisture, but the coffee oils got on the salt crystals, and everything tasted vaguely of coffee, which was just stupid. The Preparation: The burger was immolated to an angry Well Done on that furiously hot griddle, so all of the juices were converted to vapor and sucked out of the vents. 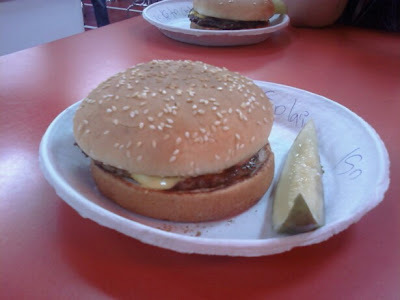 The beef was also clearly over-manipulated so the preformed patties were rubbery. Meat to Bun Ratio: Heavily skewed in favor of the bun. I couldn't finish the bun. The patties were only 1/4 pound---1/8 pound after the dessication treatment, so pretty much any bun would have been too much for this puck of beef cremains. The Bun: Standard, sesame seeded, hamburger buns, but they toasted the HELL out to them---top and bottom, so the dryness of the overcooked beef was not abated by the large bun. The Cheese: American and nicely melted. The gooey cheese was not up to the task, however, of making up for the dryness of the other ingredients of this Death Valley dish. It seemed that the order of the day at Hamburger Habit was sanitation. 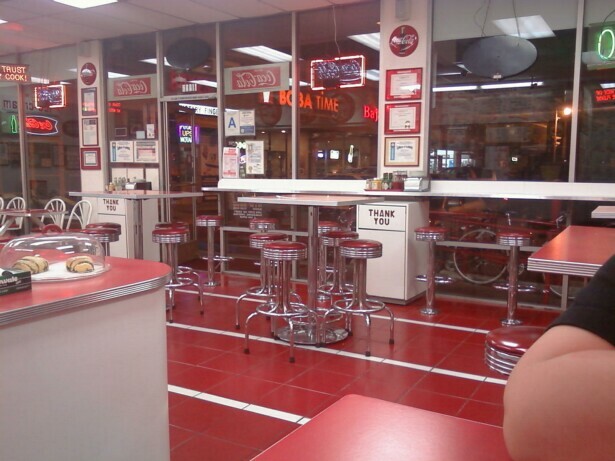 The place was gleaming, and that cleanliness made it's way into the sterile taste of the food. Not even the hardiest thermophile could have survived the cooking process. The lad cried Uncle after eating about 1/3 of his cheeseburger. It was a poor use of 14 bucks. Burger Review : Pass. 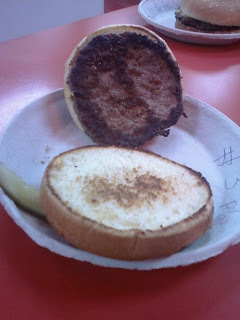 This cheeseburger's quality ingredients and flavors were not able to stand up to the incompetent preparation. When the boy won't finish it, you know it's a bad burger. Concerning the coffie in the salt..yuk, what were they thinking? Here in the south we put rice in our salt shaker's to prevent moisture. It works and the rice does not give the salt any flavor, of course. Robin, it is always nice to read kind words. I couldn't agree more on the rice in the salt--that's how we did it where I grew up, too. I have seen it done with pasta, but never with anything as oily or strong tasting as coffee.